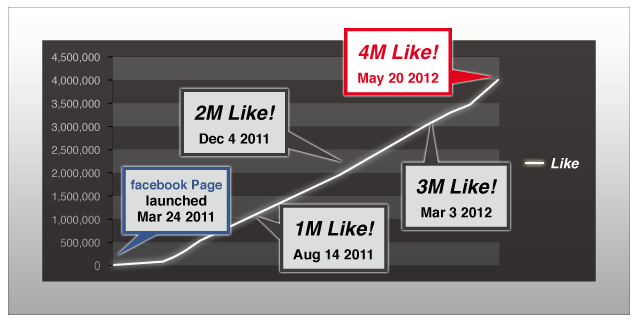 Tokyo Otaku Mode, world's first Facebook page to surpass 4 million “Likes” in the Japanese Anime and Manga category! On May 20, 2012, Tokyo Otaku Mode announced it has achieved 4 million “Likes” on its Facebook page (http://www.facebook.com/tokyootakumode ). Tokyo Otaku Mode (TOM) is the leading platform for Japanese OTAKU (Japanese anime and manga related) news and information. TOM shares the latest Japanese OTAKU culture news and information straight from Japan everyday, covering the latest OTAKU events, figure collections, Nendroids, manga, anime, and even cosplay. TOM will soon be launching cutting-edge apps and services for anime and manga fans. They will be expanding their social platform to not only share interesting news, but also to create opportunities for OTAKU fans to meet and collaborate with each other as well as artists. Through its new services, TOM hopes that new artists and creators will emerge from the millions of OTAKU fans. Tokyo Otaku Mode (TOM) was established by the Delaware organization, Tokyo Otaku Mode, Inc. TOM provides the latest and coolest Japanese Otaku culture news available on the web. Located in TOKYO, home of the epicenter of OTAKU culture, AKIBA, TOM makes full use of its location in order to share with the world the same OTAKU culture experiences available in Japan. TOM works to provide easy access to the coolest and latest anime and manga related news and products that have inspired prominent artists and creators.